A francophone community radio station based in Labrador City pocketed thousands of advertising dollars — for years — without going to air. A francophone community radio station in Labrador City pocketed thousands of advertising dollars — for years — without going to air. 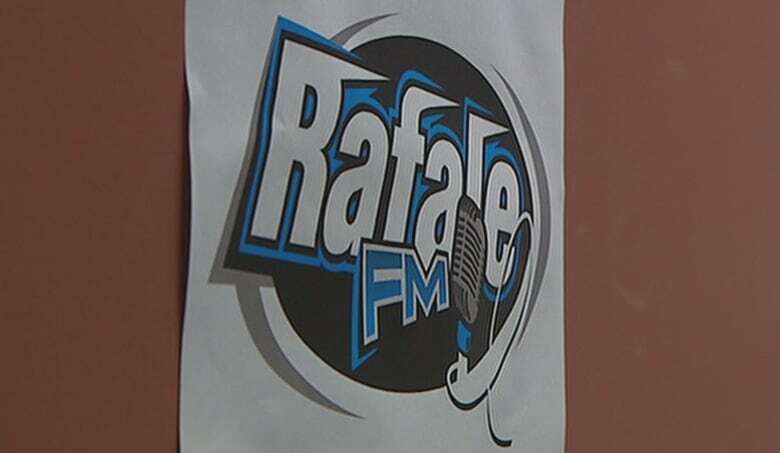 Radio communautaire du Labrador, more commonly known as Rafale FM, hasn't produced any local programming since 2015, according to several sources. Ad agencies, their clients and federal departments are now on the hunt for answers. Between 2009 and 2012, the federal and provincial governments invested more than $600,000 to create Rafale FM, a provincial francophone radio network with transmitters in Labrador City, St. John's and Mainland, N.L., on Newfoundland's west coast. But technical problems and exhausted volunteers have left the radio station unable to operate since July, according to Gaël Corbineau, Rafale FM's managing director. 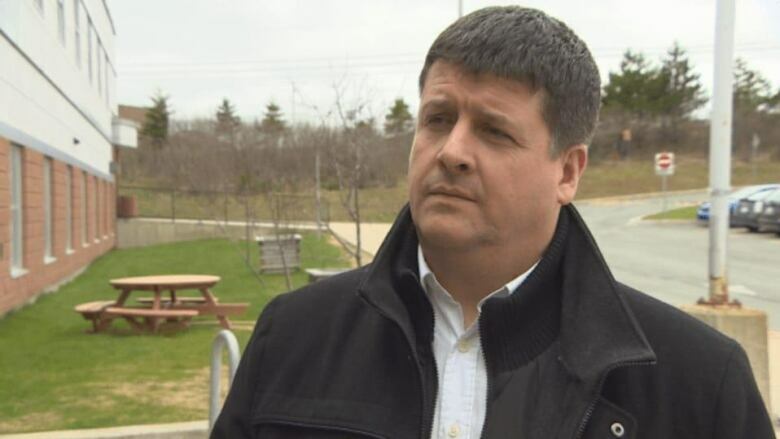 "We let a situation drag on that wasn't normal," said Corbineau, also the managing director of the Francophone Federation of Newfoundland and Labrador. However, sources contacted by Radio-Canada in Labrador City indicate no programming has been produced at the radio station's studios since at least 2015. Journalist Éric Cyr has driven from Fermont to Labrador City once a week since August 2016, and regularly flicks through all the local radio stations and remembers hearing sound on Rafale FM only once. "It might have been two years ago.… They were doing tests for about a week, maximum," he said. "After that, it stopped, and I haven't heard anything since." Lise Boucher, who lives in Labrador City, regularly checks 97.3 FM to see if Rafale FM is on the air. "I have an old truck that flips through the stations and stops automatically. There's never anything, ever," she said. Rafale FM's CRTC broadcast licence stipulates all its programming must originate in Labrador City. The transmitter situated in St. John's can only be used "to broadcast, in its entirety, the programming of CJRM FM Labrador City." Rafale FM's Labrador City studios are located in the same building as the Francophone Association of Labrador. Michel Bourbeau, the director of the regional association from September 2017 until December, says it's clear no programming was being produced at the studios while he was in the job. And Sophie Lalancette, who held Bourbeau's job from 2015 to 2017, said she also remembers the studios being "closed and unused." 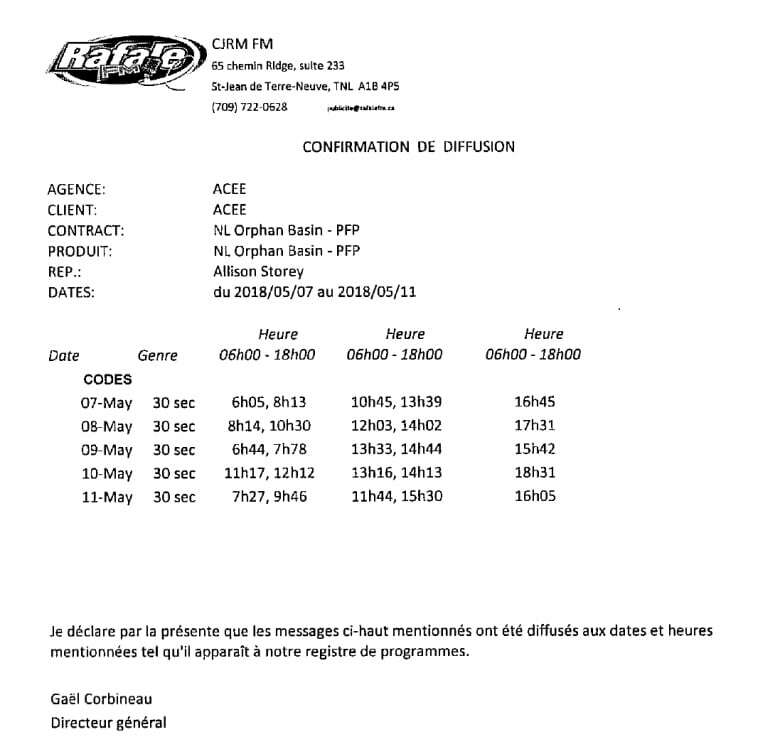 Numerous federal government departments and agencies revealed to Radio-Canada they have paid Rafale FM for advertising over the past four years. Walmart and Ford also purchased air time, through the marketing agency Mindshare. The federal government confirmed that Montreal-based communications firm Cossette has purchased at least $10,000 of advertising for Ottawa since 2015. The Canadian Environmental Assessment Agency also verified that between 2016 and 2018 it purchased $3,363.75 in advertising directly from Rafale FM. Target Broadcast Sales, a Canada-wide radio advertising agency, said it sold advertising spots for Rafale FM until the end of March. It said that's when it found out the radio station was no longer on the air. "We were under the belief that CJRM was on air and was accepting advertising. We were not made aware that the station was no longer on the air," said Stephen Sienko, president of Target Broadcast Sales. Devon MacDonald, CEO of Mindshare, the company that bought radio advertising for Walmart and Ford, said Mindshare is working with Target Broadcast Sales "to resolve this to our clients' satisfaction." "I'm concerned about a system (where) this can happen, where regulating bodies can allow this to happen," MacDonald said. According to industry practice, in order to prove advertising goes on the air, community radio stations need only submit a written confirmation of broadcast to their clients. No confirmation beyond this document, known as an affidavit, is required. Radio-Canada obtained a copy of an affidavit signed by Rafale FM director Corbineau that said advertising for the Canadian Environmental Assessment Agency had aired between May 7-11, 2018. But multiple sources confirm the radio was not on the air in Labrador City during that period. In a phone interview with Radio-Canada, Corbineau refused to say whether the radio had received money for advertising while it was off air. "No one (at the radio) was paid for anything. We made every effort to save this radio station. We fought to maintain it for years. Unfortunately, a major technical problem disrupted our operations, but also, our volunteers are exhausted," said Corbineau. According to Corporations Canada, the public body that regulates federal corporations, the board of directors of Radio communautaire du Labrador has five members. One of them, Normand Gillepsie, died in February 2015. Industry, Science and Economic Development Canada said "organizations must notify Corporations Canada of any changes concerning administrators within 15 days of a change." The department specified that according to its records, Radio communautaire du Labrador renewed its list of administrators in 2017. "The mandate of a director ends with their death," it added. Radio-Canada attempted to contact the other members of the board of directors. Julie Blanchette did not wish to comment. Ali Chaisson, Nancy Boutin and Jules Custodio did not respond to requests. A previous version of this story said funding to expand the radio station province-wide came entirely from the federal government. In fact, it was federal and provincial government money. 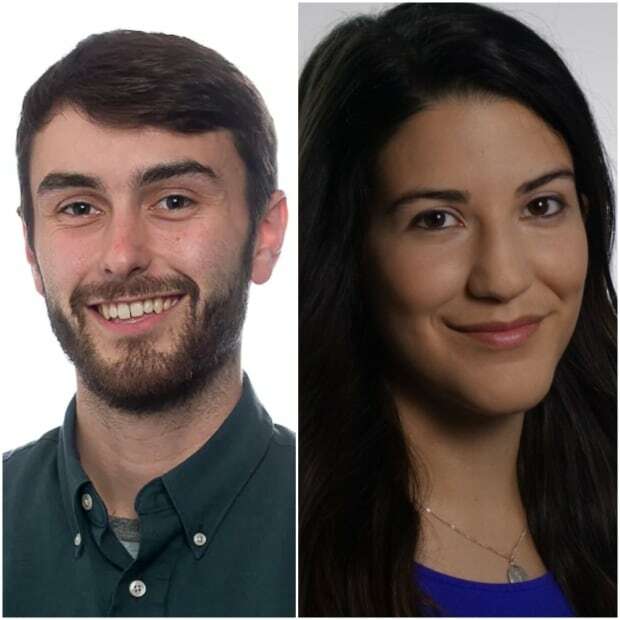 Patrick Butler and Marie Isabelle Rochon are Radio-Canada journalists who work from St. John's.